For everything that you do, even for groceries, setting up a budget is the 1stand the most essential step. If you have a budget set for all your expenses, you’ll be on the safer side. When planning to buy groceries, start off with setting up a budget for your groceries. This will help you in making the list, prioritizing and will save you from spending on unnecessary things. The next thing after setting up a budget is to make a list of all the things that you need according to your budget. Prioritize things as per your necessity and budget. Milk, veggies, eggs, bread, fruits, sugar, etc. are the most important ones and need to be given priority, other snack items can be cut down or can be bought in lesser quantities. STICK to the list. Be determined to spend on the essential ones first and then go to the extra ones. You don’t need everything that’s on SALE! Don’t follow “I’ll buy it coz it’s on SALE” rule. Out of the 10 things that are on sale, you probably eat/need 5-6 of them, so don’t start buying everything that’s available for a lesser amount. Buy things only if you or your family eat/need them. If you see non-perishable items like flour, sugar, pasta, oil etc. on sale then its always a good idea to buy those in bulk as these do come under the priorities category of your list and can be stored for a longer time. But buy the perishable ones as per the required quantity. Choose wisely. Plan your meals for the week in advance as this will help you shop better. When you’ll know what you’ll cook and what all ingredients you’ll need, then you can choose better. This will reduce the confusion and will save you from buying anything that won’t be put to use. Hence, nothing gets wasted. People often overlook the in-store brand products and go for the name brand that makes their bill go up! Many times, the in-store and name brand products are similar but just have different labels. This can help you save more as most of the times its just the brand’s goodwill that you are paying for, otherwise the ingredients are mostly similar in name brands and in-store brands. Make use of those grocery store coupons and ads that you see in the weekly. Many stores provide discounts, reward point, and other exciting offers. Sign up for store’s emails/loyalty cards etc. and make the most of their coupons and offers. Try to avoid offseason products like veggies and fruits as the shipping costs are added to their original price and this makes them costly. Buy the in-season items and avoid paying extra. 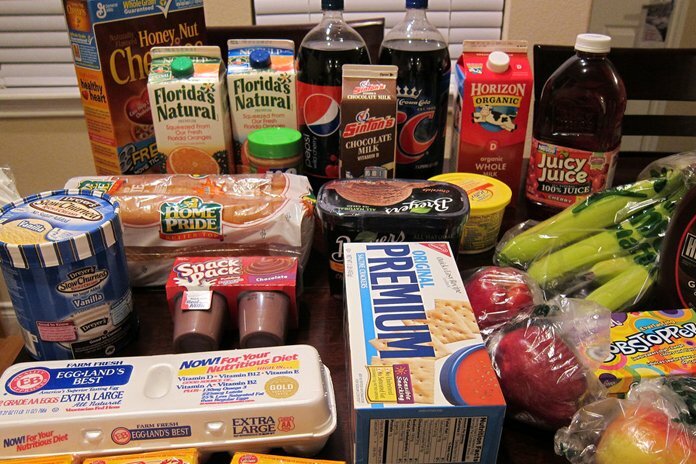 Packaged foods are generally costlier than the fresh ones. Avoid buying packaged food and go for the fresh ones. Buying packaged food means that you are just paying extra for the marinating and storage process. You can very well marinate your meat and store food on your own. Keep a track of prices of products in different stores. Sometimes prices vary from store to store, what may be costly in one store can be on sale in the other store or can be priced at a lesser rate. Also, sometimes you might get more quantity of a product at a store at a lesser rate or with some offer than a store that is selling it at a higher rate with less/equal quantity. Try not to bring your kids as they tend to get distracted with a lot of stuff in the store and it’s really hard to say no to them or to convince them on not buying something. When you go grocery shopping with your kids, you definitely end up buying more things than you planned.